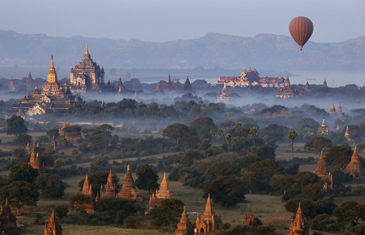 Arguably Myanmar’s greatest archaeological treasure, Bagan was the capital of several ancient Burmese Kingdoms between the 11th and 13th centuries. Today, more than 2,000 of its original ancient temples remain standing. We visit one of Myanmar’s most sacred and significant Buddhist sites, Shwezigon Pagoda. This magnificent 11th century pagoda marks the first royal endorsement of traditional Burmese spirit worship with Theravada Buddhism. At sunset, attend a special chanting and candle lighting ritual, where locals extend offerings to Buddhist monks in order to gain merit and get closer to attaining enlightenment. As the red-robed monks chant ancient Pali scripts, 1,500 candles are lit – a truly magical spiritual experience. We explore temples in the Bagan area, starting with Lemyethna, a white-washed temple crowned with an Indian-style stupa resting upon a high ledge. Although built in the 13th century, it is still frequented today by worshippers. Continue to Payathonzu Temple, displaying remarkable similarity to Khmer Buddhist ruins in Thailand and 13th century Nandamannya Temple, resplendent with fine frescoes and murals. A horse-cart ride to Minnanthu village lends a breather from temple hopping and a glimpse of local life. 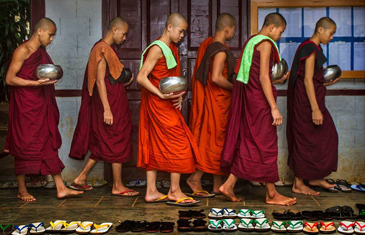 We later visit Shwe Gu Monastic Education Centre, a humble monastery within a pagoda that cares for around 50 young orphans, training them to become Buddhist monks. In Myanmar, monastic schools assist in providing basic educational needs, especially for orphans and children from disadvantaged families. We meet both novices and teachers, who are highly appreciative of our visit and support. Drive out to Salay Village and Yokesone, Myanmar’s oldest surviving teak wood monastery. 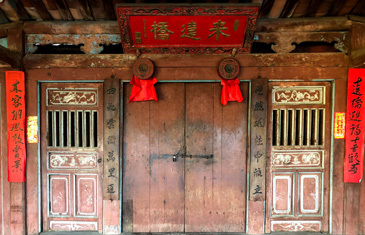 The 130-year-old monastic hall is built on 154 teak pillars and famed for intricate wood carvings adorning its aged outer walls. Continuing on, more astounding sites include Payathonzu, a complex of three brick shrines adorned with exquisite mural paintings dating from the Bagan Empire-era and 13th century Man Paya Pagoda, housing an enormous lacquer Buddha image. We head to the quaint village of Wat Khoung, one of the region’s largest villages. Toddy-palm fences surround this village, where residents on bullock carts still collect water from the river and children wear the Burmese traditional top-knot hairstyle. By way of traditional ox cart, we visit a monastery and meet the locals. Encircled by mountains, nestled at the confluence of the Mekong and Nam Khan rivers in northern Laos, Luang Prabang is considered the heart of Laotian culture and retains a unique ambiance. This UNESCO-World Heritage Site and ancient royal capital is also one of Southeast Asia’s most beautiful destinations. Baci ceremonies are an integral part of Lao culture, a ritual marking milestone events, such as marriages and death. This ancient practice is based on the belief that the ‘kwan’ (soul), which guards the body and its 32 organs, will be realigned and rejuvenated. We have a unique opportunity to participate in an authentic Baci ceremony at a Luang Prabang family home. A village elder will wrap a white cotton thread around the recipient’s wrist, while chanting mantras to strengthen the blessing’s power. Luang Prabang’s stunning architectural mix draws influences from both the East and the West – from faded Indochina colonial-era to traditional Lao Wats (temples). Attend a one-hour presentation on Luang Prabang’s heritage preservation projects, presented by an esteemed UNESCO writer-consultant. Afterwards, a guided walking tour reveals the town’s distinct architectural heritage. The afternoon, we board a long-tailed boat and cruise upstream to Pak Ou Caves. Perched high on a limestone cliff, these two grottoes house 4,000 sacred Buddhist statues and images. Worshippers, including Lao royalty, have visited this revered cave-temple for centuries. Returning to Luang Prabang, we disembark at Ban Muang Keo village to observe weavers and whisky distillers practice time-worn craftmanship. We explore the area around one of Luang Prabang’s most picturesque sights, Kuang Si Waterfall. Take a leisurely hike through parklands to reach Kuang Si Bear Rescue Centre. Many bears have been rescued from the clutches of bile farms or wildlife traffickers, destined for use in the traditional medicine trade. 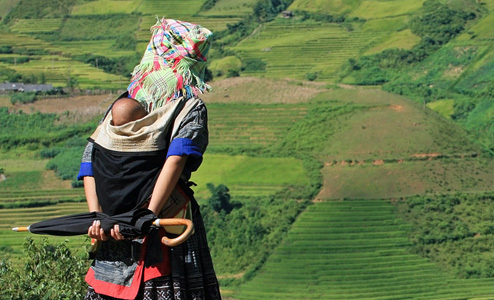 A guided tour teaches us what can be done to protect one of Laos’ most endangered species. We also assist with the bears’ daily ‘scatter feed.’ Afterwards, cool down with a refreshing swim at Kuang Si Waterfall. At Muang Khai village, at a monastery and 19th century temple, we meet an expert in Lao Buddhism and Buddhist practices. She will lead our one-hour group meditation session, in a historic meditation Sala in the temple’s riverside gardens. 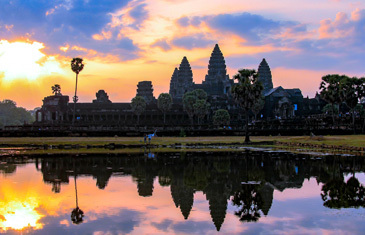 Located in northwest Cambodia, Siem Reap is gateway to the Angkor Archaeological Park, a UNESCO World Heritage Site containing the stupendous remains of a former Khmer civilisation. There is more, however, to this provincial town, increasingly known for its stylish boutiques and thriving arts scene. Spend an enjoyable afternoon getting acquainted with some of Siem Reap’s alternative attractions. 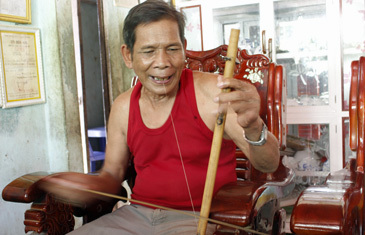 Artisans d’Angkor, a socially-committed Cambodian outfit, is well-known for successfully reviving traditional Khmer craftsmanship, such as silk production and silver plating. At Wat Damnak, one of Siem Reap’s most important pagodas, we receive a personal blessing from one of the Buddhist monks. Our day concludes with a stop at the town’s old and new markets, on opposite sides of the river – both markets ideal for authentic souvenir hunting. 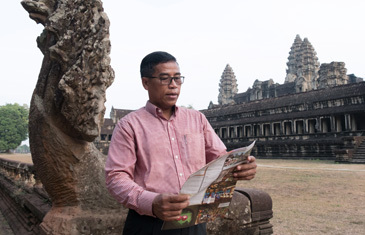 Explore lesser known but still impressive ancient sites within the Angkor Archaeological Park. We start at Prasat Kravan, a small temple noted for its bold, refined sculptures dedicated to Vishnu and little-visited Banteay Kdei, a peaceful compound, home to a rare, ancient Buddha statue. We drive across jungle reaching Ta Keo, a five-layered mountain temple, 22-metres (72ft)-high, constructed from the 11th century, but still half-built. Our afternoon continues, exploring a series of peaceful temples. These include miniscule Ta Som, largely left untouched and instantly recognizable for overgrown fig trees and other vegetation bursting through its stone ruins. Our final temple, Pre Nup, coincides with sunset time; from its elevated perch, we can catch the sun’s dying rays spreading across the countryside below. Head north of Siem Reap, driving deep into one of Cambodia’s more remote provinces, enroute passing traditional Khmer communities. We reach Preah Vihear, an awe-inspiring Hindu temple built during the six-centuries-long Khmer Empire. It received UNESCO World Heritage status in 2008 with good reason. Cambodia’s most dramatically placed Angkorian monument rests atop a steep escarpment in the Danrek Mountains, revealing breathtaking views across the low-lying plains of both Thailand and Cambodia. The peaceful, 800-metres (2624 feet) temple was a key edifice of the Khmer Empire’s spiritual life, modified by successive kings, thus displaying diverse architectural styles. Today, it still bears the scars left by fierce fighting, as recently as 2011 and sits on a once highly disputed area of land on the Thai-Cambodian border. The ancient riverside town of Hoi An was a major ‘Silk Road’ trading port from the 16th to the 19th centuries. 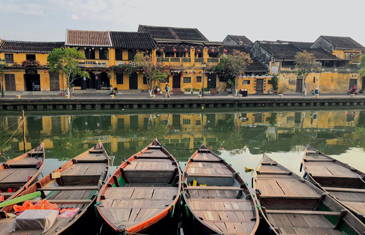 One of Southeast Asia’s oldest towns, today Hoi An is a UNESCO World Heritage Site, with well-preserved architecture and historical sites and an antiquated ambiance. Meet with a member of Hoi An Relics Conservation Centre, learning more about Hoi An’s centuries-old culture and current local government and UNESCO projects. We take a guided tour of the Old Town quarter on foot. Much of Hoi An’s atmospheric and historic buildings, a fusion of Vietnamese, Chinese, Japanese and European architectural influences, are concentrated along these narrow streets. Iconic highlights cover ancient Chinese merchant shop-houses and 16th century Japanese Covered Bridge. A leisurely boat ride along the Thu Bon River transports us to Cam Kim Island. From here, we commence a cycling tour, winding our way along village roads and quintessential bucolic rural scenes. 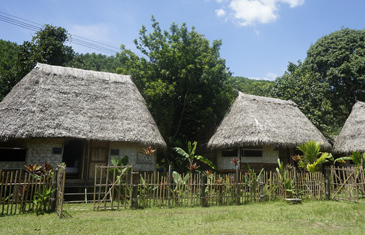 We stop-off at the peaceful village of Tra Nhieu, which still maintains traditional village livelihoods, such as farming, fishing and livestock breeding, besides mat weaving. Invited into the homes of some local families gives us a great opportunity to see up-close the cottage-industry style production of rice wine, rice noodles and rice paper. Back on the river, amidst a picturesque water coconut forest, we try our hand at rowing the round, bamboo basket boats, typical of central Vietnam. This morning, drive out from Hoi An through the outlying Thu Bon River delta. Heading deeper into the highlands, passing isolated rural villages and tea plantations, we eventually reach Trung Mung. This traditional village is actually a Co Tu ethnic minority community, renowned for its intricate wood carvings. Here, there is a unique opportunity to meet the patriarch of the Co Tu minority group, who will regale us with tales about the village rural culture and history. An invitation is extended for a hosted lunch at his house, entertained with a performance of typical Co Tu musical instruments. Transfer to Danang airport for your onward flight. Our classic journey across Myanmar, the ‘Hidden jewel of Southeast Asia,’ takes the intrepid traveller on a memorable 12-days of experiences featuring the very best of cultural heritage, arts, spirituality and historical elements. 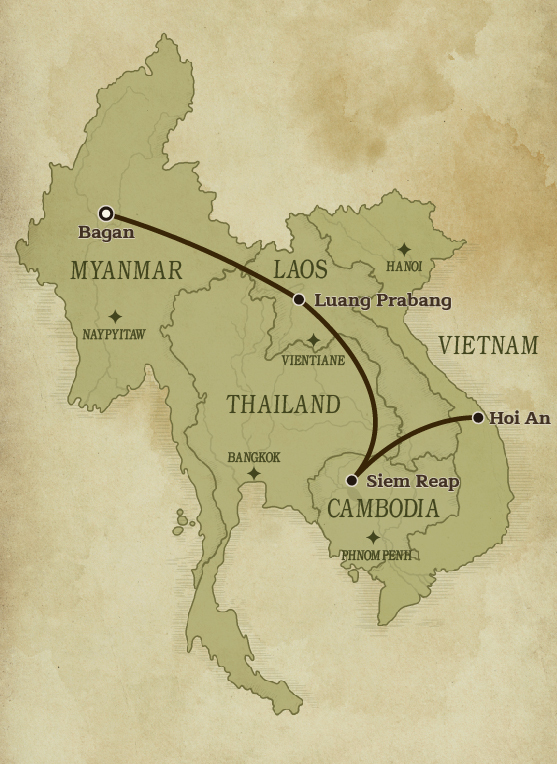 This extensive overland journey across Thailand, Laos, and Vietnam features days packed with the best adventure, culture, spiritual and historical experiences.